Rotondi Palace, since 1927 the Municipality, has on its rusticated portal a bearded head in stucco with horns framing the heraldic shield, according to a grotesque and baroque taste. 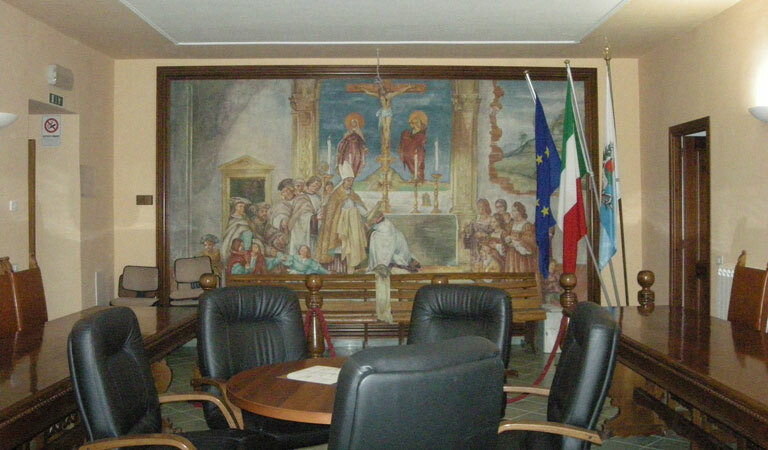 In the Council Chamber there is a large twentieth-century canvas with a sacred scene setting in the Renaissance. 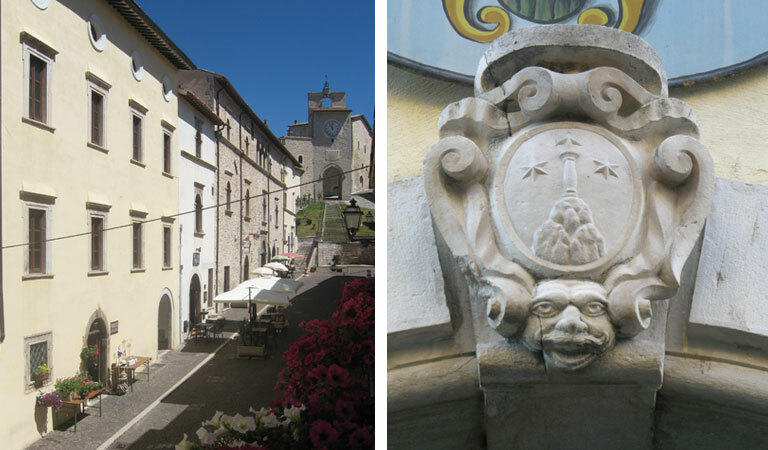 In Via del Corso Vittorio Emanuele II, at n. 18, there is Rotondi Palace, now the Municipality of Monteleone di Spoleto. Before it, in the modern era, the Municipality is first in Palazzo dei Priori (partially today incorporated in the Municipal Theatre) and then, between the second half of the nineteenth century and up to 1927, an adjoining palace overlooking Piazza del Plebiscito. With the purchase of Rotondi Palace , as a result of the sale made by Dott. 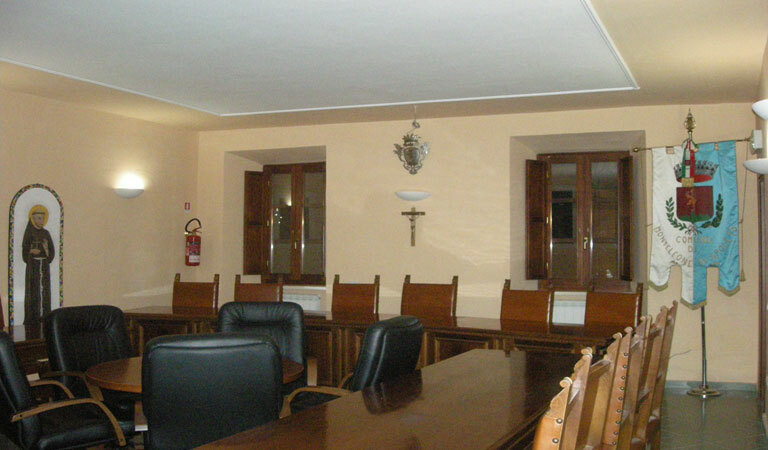 Felice (1927), the Public institution transfers permanently in the lower part of the Terziere San Giacomo. 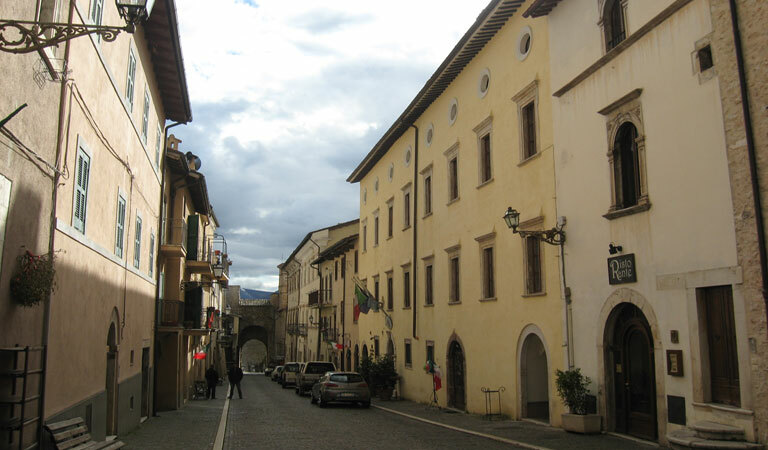 The building, which backs onto the walls of the new town, has a sober façade with sixteen windows distributed rhythmically on two orders and in a harmonious correspondence, eight oculi (openings) in the higher register. The eighteenth-century portal, with smooth rusticated stones, has on the keystone the coat of arms of Rotondi family (a column on three mountains surmounted by three stars), with the base characterized by a mustachioed head with horns, curling into scrolls and framing the heraldic shield, according to a grotesque taste typical of the baroque style and widespread especially in the seventeenth century (but present for a longer period, from the sixteenth to the eighteenth century). Inside the palace, turning right and going up the stone stairs that give access to the main floor, there are modernized rooms, employed by the local authority for ordinary offices. Where it was possible, the old wooden doors have been instead left on site and restored. 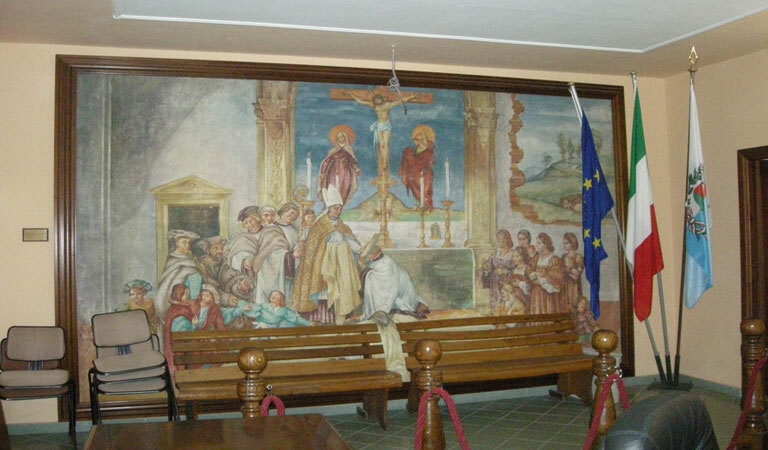 In the Council Chamber, decorations in tempera have recently emerged under the modern repainting fragments of an earlier nineteenth-century; the back wall hosts a beautiful painting of the second half of the twentieth century, depicting a holy scene in a Renaissance setting. The painting is a gift from Luigi Alfonsi, direct descendant of Bernabei of Ruscio, who carries out the restoration in 1999. Over the centuries, many members of Rotondi family cover important state and church assignments, such as the Franciscan P. Felice Rotondi (1630-1702), an outstanding theologian and metaphysician, a member of the Venetian Argonauts, emeritus professor at the University of Padua, general minister of the Order from 1695 to 1701, and restorer of the local monastery of St. Francis; D. Marzio (with a descendant of the same name in the nineteenth century, followed by D. Pietro Rotondi), which is vicar in Ferentillo and dies in 1728 (shortly after, in 1730, D. Stefano Rotondi dies at age 80). Antonio Rotondi is an agricultural engineer who is entrusted by the municipality of Monteleone, in February of 1782, to make a historical and geological report, in order to reactivate the local iron mines. He is married since 1786 with the young Cecilia Accica of Norcia, who brings him a dowry of ten thousand crowns. Fifteen letters of his “mine”research are kept in 1903 (filed in a private family archive) written by the Prefect of the Good Government, Card. Filippo Carandini (1729-1810). In the period of French occupation, Antonio Rotondi has starred in several events, covering from 1790 to 1798 the position of constructor with Girolamo Moretti. 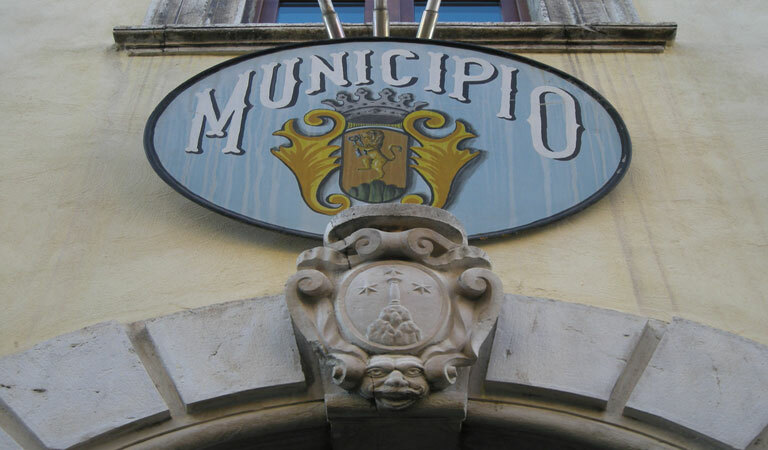 Other family members are Francesco, Mayor in 1890, and Antonio, a city councilor in 1895. Luigi Rotondi is the author, in 1890, of a license application to research for brown coal (and a discovery of a mine statement) in Monteleone di Spoleto, as a result of the discovery and the use of this mineral for a lime kiln for the construction of the new carriage road between Monteleone di Spoleto, Leonessa. 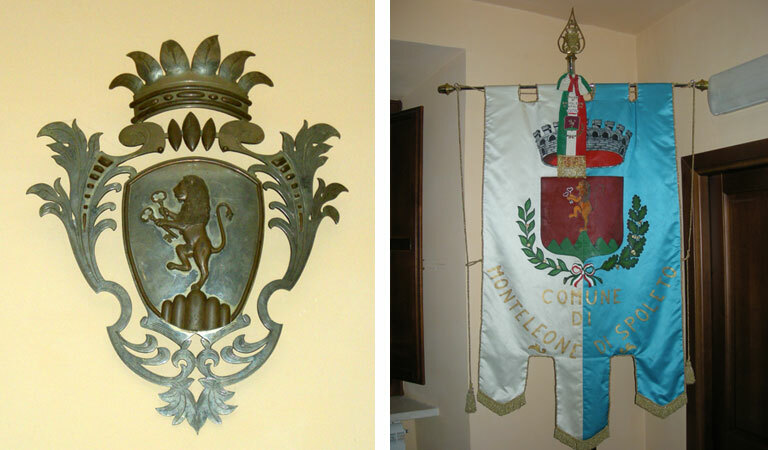 Antonio reappears, along with Isidoro Vannozzi, in the report prepared by the Command of the Royal Carabinieri of Norcia in July 1902, containing a list of objects recovered from the princely tomb of Colle del Capitano. one can remember also Giuseppe, a centurion of M.V.S.N. (Voluntary Militia for National Security), and Clementina Rotondi (1920-1991), intellectual, bibliophile and palaeographer archivist. The latter is a prominent figure of the mid-twentieth century, effective member of the Deputation of the Tuscan country's history and secretary of the Tuscan Society for the History of Italian Unification, Director of the University Library of Bologna (1979) and, from 1980 to 1985, of the prestigious Marucelliana Library of Florence. For her intensive activity of research and historical publication, in 1985, a miscellaneous of writings are dedicated to her.